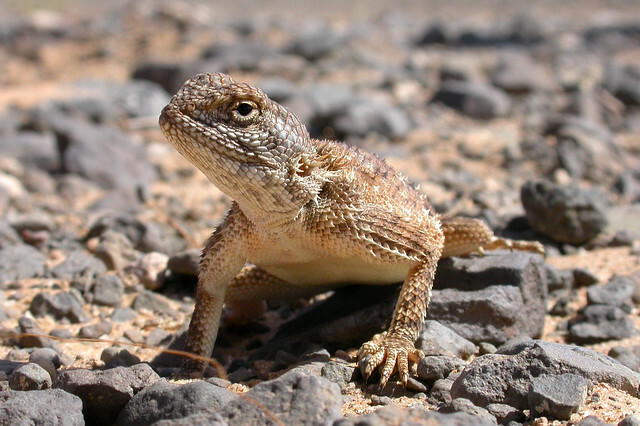 Can you confirm these amateur observations of Agama rueppelli? occidentalis: “South-Abessinia [= Ethiopia] through N Kenya”. Type locality: mouth of the Kaliokwell River, Lake Rudolf, Kenya Colony. vaillanti: Somalia; Type locality: “Ogaden and between Laffarug and Aberio, Somaliland”. Lectotype [vaillanti]: MSNG 28850, adult male, from ‘‘Ogaden,’’ Ethiopia. Diagnosis Diagnosis. 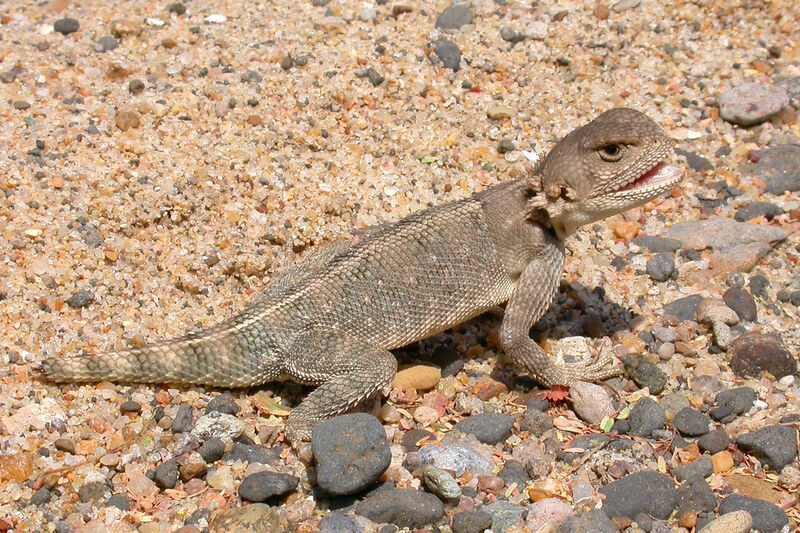 A medium-sized Agama with a maximum total length of 280 mm. Males (58–88 mm SVL) smaller than females (76– 88 mm SVL). Body depressed, hind limbs long. Tail more than 65% of total length, very broad at its base, tapering sharply. Gular pouch absent. Head convex, with the upper surface of the snout flat. Head scales smooth, equal to ventral scales, with the occipital scales variable in size (equal to other head scales to slightly enlarged). Nostril directed posterodorsally, completely visible from above, pierced in the posterior part of a large nasal scale, situated above the canthus rostralis. Usually with one to two scales between nasal and first supraciliary scales. Supraciliary scales smooth. Nuchal and dorsal crest absent. Ear opening only half the size of the eye, surrounded by tufts of spinose scales hiding the tympanum. Body scales large, homogeneous, keeled, mucro- nate, and erect, in 54–64 scale rows around midbody. Vertebral scales 59–66. Gular and ventral scales smooth, ventrals smaller than dorsal scales. Lamellae 14–16 under the fourth toe, third and fifth toes nearly equal in length. Males with one row of 9–13 precloacal pores. Etymology Named after Eduard Rüppell (1794-1884), German herpetologist. Lönnberg, E. 1911. Reptiles, Batrachians and Fishes collected by the swedish Zoological Expedition to British East Africa 1911. Kungl. Sv. Vet. Akademiens Handligar. 47(6): 1-24.